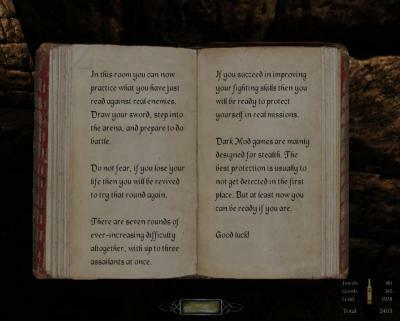 Yo, just started playing today, and while I was going through the tutorial, I found missing text in the book of the combat section. If it's trivial, ignore this post. I was just thinking it's sort of bad having stuff like this in a tutorial. Thanks for the head up, I can fix this in due course. I think this is often the case when the mission was build for, e.g., version 2.04, and is played under version 2.06, right? 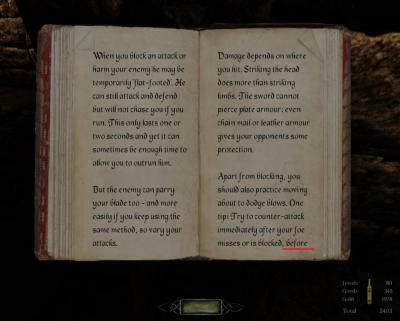 Just as an example, but, it often occured to me that missions have that kind of issue when something was changed which "breaks" the text in a update. I recently had that issue as well, but, can't remember the mission.